After my first few hours of play, I was puzzled (pun intended) how so many people were making a big deal of a Puzzle-RPG with such generic trappings. The story, art, settings, and even the music all looked lifted from the most uninspired fantasy games! Fortunately, I stuck with the opening tutorials and was rewarded with an extremely deep, fun, and addicting marriage of the RPG and puzzle genres. I suppose the game could have been better if it fixed its clear shortcomings, but then again, I doubt Tetris would have been a much better game with arresting artwork and clever writing! For puzzle games, it’s all about the mechanics. Puzzle Quest was the sort of game that kept me saying ‘one more match,’ which was a phrase that my PSP handled very well. By the time I got War of the Lions for the PSP, I had already finished FFT twice. Even in my third playthrough of FFT, the game was still among my favourite and most memorable experiences on the handheld! I can't say it was because of the minor additions added to this version, but more because of just how fresh FFT remains no matter how much I play it. With the ability to play it on the go, FFT is even more playable. And since it has been a few years since I played it, it’s high time I get started on that fourth playthrough! Cut from the same cloth that went on to make FFT, Tactics Ogre is great for many of the same reasons. TO never reaches the heights of FFT due to its balance issues (can the Archer be anymore overpowered!? ), but that’s not to say it doesn’t have its own brilliance. The battlefields are massive and the battle system is among the deepest in SRPGs (only Front Mission approaches this game). And I can’t say I this games feels archaic at all for a touched up 17-year old game! Monster Hunter is all the rage in Japan and for good reason; unlike MMOs and other majestically open RPGs, Monster Hunter puts you in tightly designed maps which you visit frequently. Best of all, you don’t have to wait long to slay the giant monsters! Other than that, I’m not going to have time explaining why this game is just so fun to play. Then again, hoarding loot and hunting enormous monsters shouldn’t be a difficult thing to understand! Ac!d 2 took the wackiness of the original game and took it a step further; adding cel-shaded graphics! No, this is not the Metal Gear Solid I came to know and love, but I didn’t mind. 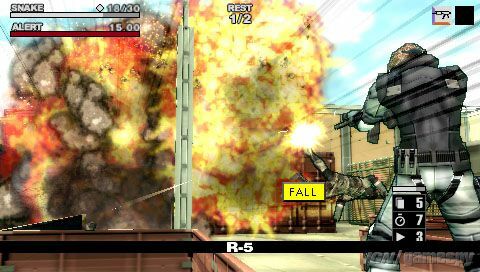 Honestly, the Ac!d games interested me far more than the other PSP Metal Gears. That’s largely thanks to the excellent SRPG battle system (this is a genre the PSP is good at). The story, though largely not canon, was also very cool to me and thankfully lacking the long winded cut-scenes that plagued MGS4.